Cool, could be a mistranslation or some kind of artistic embellishment by the author then. Not that I actually believed it was true since it didn't make sense to me and that was the only place I had heard of that. The "Big bang" was mistranslated in Russian as "Big explosion". This caused a huge misunderstanding of the nature of Big bang among people who are unfamiliar with astronomy. They imagine the Big bang as an explosion, something already existing in space, as an expanding ball of plasma that then turned into galaxies. So they often ask where is the edge of the shock-wave, and what is behind it. But the reality is that the Big bang is an event that created space itself, and that space was initially filled with matter uniformly, so there are no shock-waves and edges, just an expansion of the space filled uniformly with galaxies (at large scales). The "Big bang" was mistranslated in Russian as "Big explosion". This caused a huge misunderstanding of the nature of Big bang among people who are unfamiliar with astronomy. The term "big bang" already does the same for people who speak English, they also think of an explosion. This is the most common misconception about the nature of the Big Bang (a name that I hate) and the main reason that most people don't get it. So they often ask where is the edge of the shock-wave, and what is behind it. Yes! Exactly what I mean. Finnish uses the word "alkuräjähdys", which would be "origin explosion" if translated literally. This causes the same misconseptions as the Russian word. I would curse Fred Hoyle for originating the term, but it's not really his fault. The fault lies with the scientists who adopted the term, just like the less-important fiasco over the "God particle". Same nonsense, different day. The Big (or "Great") Expansion would be a more proper term. I wonder why that's not being used. Same situation for the Greek language: it is known as ''Megali Ekrixi'' pronounced: Me-Ga-lee A-Cree-ksee which, if translated to English word-for-word means Big Explosion. It still causes plenty of confusion and misunderstanding. Yeah, it's not so much as understanding the translation rather than understanding the concept. Does anyone know if this is really what it would look like? A smudge with a brighter centre rather than a clear spiral structure? Or is SE's model not very accurate? 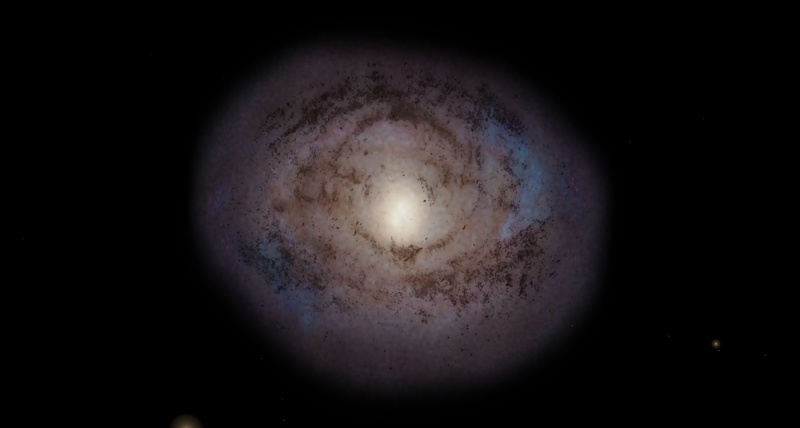 Is the milky way a barred spiral or just a plain spiral? I heard somewhere it is barred but I'm not sure. It is a barred spiral. As you have probably noticed from using SE. Not so much a noob question than a general question. I'm just wondering how close (in distance and orbital period) two stars have to be in order to be considered a contact binary? I'm sure there are other things that would be considered such as the size of the stars, but I'm just curious what a contact binary in SE would look like since they aren't generated any differently.